Not only does Aquatica’s lovely Trinity bathtub come with a delightful three-sided design. It also has three outstanding features. The first of these is form. Inspired by the nature’s most enduring organic shapes, Trinity has been crafted with soft, graceful curves and clean, pure lines that meld together to create an unusual, outstanding and contemporary design to flatter any bathroom mood. The second is pleasure. The deep, spacious interior brings together size, depth and generous water capacity to comfortably accommodate full body soaking for one or two bathers. This is enhanced by Aquatica’s Relax air massage system which features heated air massage bubbles from over 20 underwater jets, to soothe and caress and the addition of underwater chromotherapy LED lighting which adds another dimension of harmonic balance. Lastly, is Trinity’s patented cutting-edge light weight stone composite EcoMarmor™ Lite. 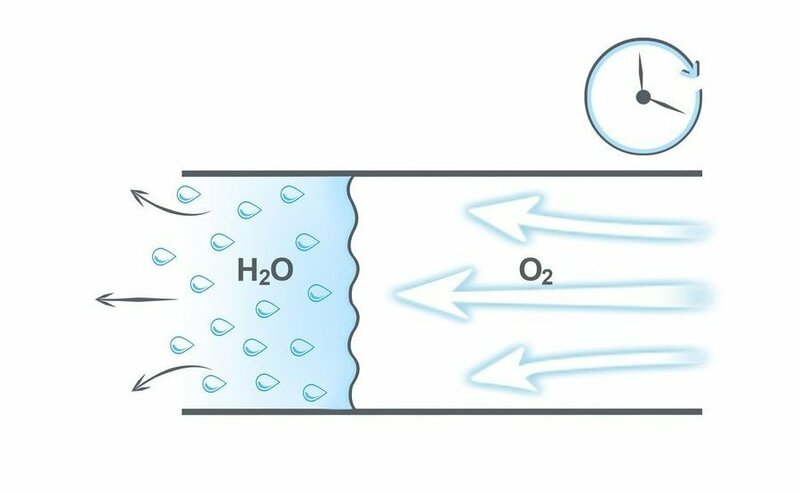 This unique innovation by Aquatica delivers the velvety smooth, soft to touch, matte white finish that is non-porous so it is easy to clean. 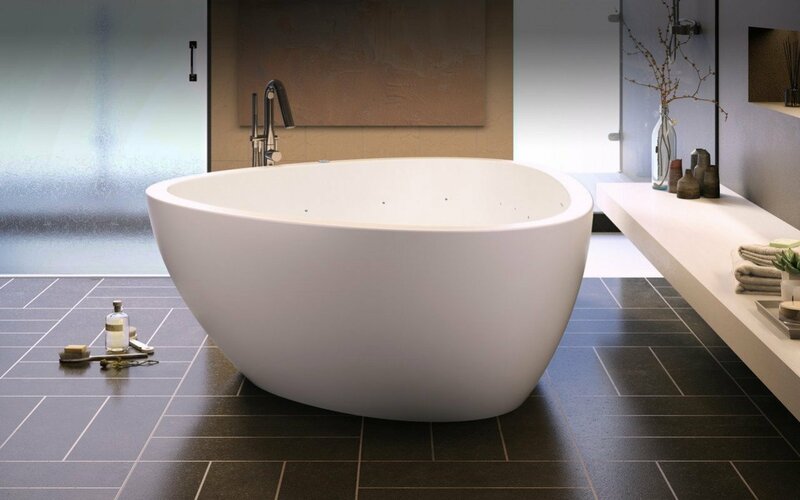 This delightful three-sided bathtub delivers triple the features. Size, depth and generous water capacity for full body soaking for one or two bathers. Contoured sides against which to sit comfortably or recline in an ergonomically optimised position. And wider rims for easy access and handy storage. This smart three-sided tub features an extra deep 16.5” design for full body soaking for one or two bathers. The shape allows you to enjoy a lying or sitting position, supported by the interior walls, curved for maximum back support and comfort. 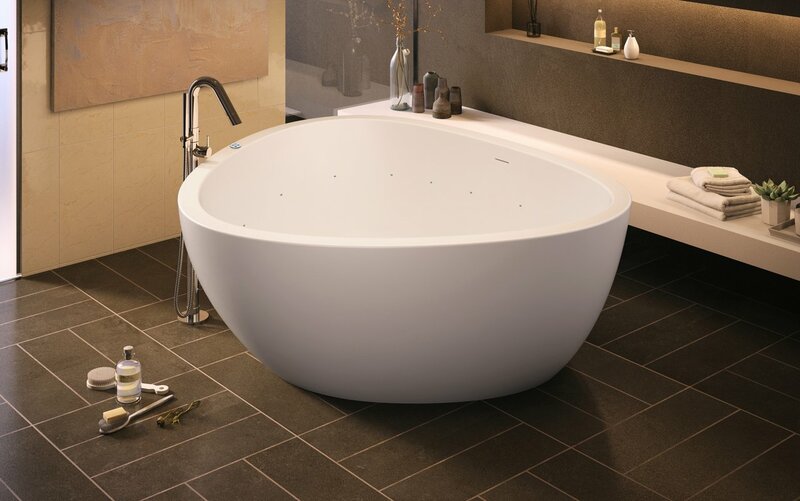 The wide rim design assists entry and exit, as well as providing a handy place for bathing needs.